The successful reintroduction of the first rehabilitated orphans to make the big journey back to the wild. In February this year we celebrated the one year anniversary of our first reintroductions – Astrid, Monic, Tarzan and Tantri back in the wild and living independently. One year is the milestone we set before we started, that determines if the reintroduction has been a success. If they can live one year in the wild, through the different fruiting seasons without needing any help from us, then we consider them properly reintroduced. These orangutans continue to go from strength-to-strength with the two-year milestone soon approaching – Astrid and Monic have their own babies, most probably fathered by Tarzan, and Tantri is living a quiet life in a valley to the south. But the biggest achievement of the project so far has just been passed; the one-year anniversary of the first rehabilitated orangutans to be released. Back in November 2012, we reintroduced Chanel, Emen, Gadis, Jamiat, Leonora, Menteng, Sif and Terusan, together with five of their babies, into the heart of the Batikap conservation forest. This was a momentous occasion for us, as the first seven of these orangutans were rescued as babies over ten years ago and have been all the way through our rehabilitation process from forest school to river islands and now to the primeval Bornean rainforest. This release was documented by the BBC in the documentary entitled ‘Orangutans: The Great Ape Escape’, where we watched their first explorations of the forest canopy and the early difficulties experienced by Emen and Menteng in particular. One year on we are still monitoring these orangutans, along with many of their friends who have since made the journey back to the wild. In fact they were doing so well we spent more time monitoring the newcomers! But once the one year anniversary arrived we went out to get a good look at each of them, to confirm that they were indeed healthy and living free and independent of people, and confirm that we had indeed successfully reintroduced ex-captive orphaned orangutans to the wild. 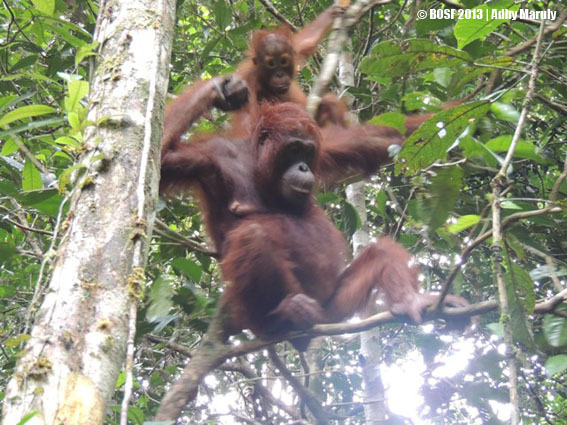 We found Gadis first, together with her four-year old daughter Garu. She was always wild at heart, angrily kiss-squeaking at us from the day of her release, and in fact we never monitored her that closely, preferring to let her do her own thing away from annoying people! She usually gets a bit angry every time we find her, but surprisingly this November she was calm and too busy feasting on fruits with exotic local names – Salintik, Dango, Ongis, Nyangau – to be too bothered by the observers. Emen was located soon after, as she never strays too far inland from the rivers. She’s become well known in the local community because her missing fingers make her instantly recognisable, and we’ve received several reports of her from local people passing on the river. She ignores them though, she isn’t fussed by people any more. Her and her son Embong are doing great. A couple of days later, the radio-tracking equipment we employ pinpointed the location of Leonora. We have spent a lot of time with Leonora over the past year to keep check of her and her son Lamar, because our pre-release assessment suggested she might struggle the most. Well it hasn’t turned out that way – even though they do like spending more time on the ground than the others they still find lots of food in the canopy – and we are delighted with her presence. We stayed with them for three days, collecting the usual behaviour data – lots of figs and barks in her diet – and checked her faeces for parasites before leaving her alone once again. We searched for Sif and Sifa in the same general area as Leonora and Emen, because the last time she was seen in October it was around here. But we had no luck in finding her or even recording her signal in November, so we’ll keep looking in the New Year. 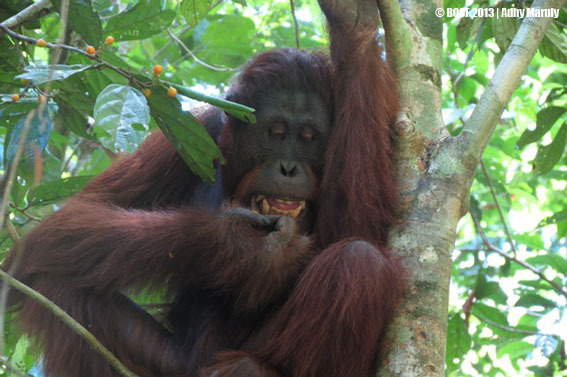 Sif has been a fantastic orangutan, taking to the forest with ease and giving us no scares whatsoever. These females are still living near their release point, but to find the males Jamiat and Terusan we had to travel a lot further. Terusan left his release point very early on, and for months we didn’t find him at all until May when his signal was picked up far to the north. We still haven’t observed him, but his signal keeps moving around so we take that as a good sign, and we last recorded him on November 10th by the Ponut rapids at the most northerly point of the release site. Jamiat also took a lot of searching to locate, but locate him we did! We radio-tracked him over the course of two weeks in the Monnu region, and finally laid eyes on him on November 23rd. He is another orangutan who doesn’t like people – who can blame him after his childhood ordeal – and the whole time our observers Arfan and Sangai watched him he broke branches and kiss-squeaked, and his hair stood on end, a sure sign of anger. So they didn’t stay for long, and after they left they could hear the unmistakeable sounds of seeds being cracked by his powerful jaws. Jamiat was released as an adolescent, but one year later his cheekpads are developing – he is maturing into an adult. So we found six of the eight independent orangutans alive and well one year after release. 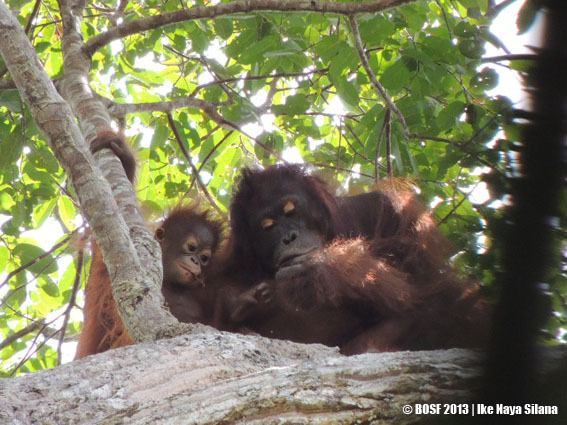 It’s been a while since we’ve seen the other two, Chanel (with her son Charlie) and Menteng. Chanel was our top candidate for reintroduction because she lived on the river islands just like a wild orangutan would, hardly ever coming down for the feedings. She moved north straight away after release, giving us just a few days observation before she moved away for good. Since then we have had just occasional records by radio-tracking, the last one in May; although we received an intriguing report by local eaglewood collectors of a female orangutan and baby far up the Tajoi Besar river. This site is 3 days walk for people, probably a little less time swinging for an orangutan, but far nonetheless. If this report is true then it can probably only be Chanel, as she is the only female with an infant that we don’t know the whereabouts of. Menteng, meanwhile, hung around the riverbanks for months before finally moving inland in June. Male orangutans like to wander so we wish him all the best and hope to catch up with him again in the future. Overall we are delighted with the progress made by all our orangutans to date, and can’t quite believe it has already been one year since these rehabilitated orangutans took their first swings in the forest. Today was the last day of the 7th orangutan release event from the BOS Foundation Orangutan Reintroduction Program at Nyaru Menteng and the first cross-province orangutan release from Central Kalimantan Orangutan Reintroduction Program (Nyaru Menteng) to the Kehje Sewen forest in East Kalimantan. This first cross-province orangutan release involved the collaboration of three of our programs – Nyaru Menteng, Samboja Lestari, and Orangutan Habitat Restoration (RHO). Although complicated to organise, these activities are critical in order to ensure the preservation of this unique species. Following the required DNA testing procedure prior to any planned orangutan reintroduction event and in line with national and international (IUCN) guidelines, the BOS Foundation received information that eight of our orangutans were not situated in the correct geographical locations. Although these orangutans had been through years of rehabilitation at our two Orangutan Rehabilitation Centers, 5 orangutans located at Samboja Lestari in East Kalimantan were of Central Kalimantan provenance hence we relocated those individuals to our centre at Nyaru Menteng on Thursday 28 November 2013. Furthermore and located at Nyaru Menteng, Central Kalimantan, DNA test results showed that three orangutans – mother-daughter Sayang and Yayang, along with an adult female, Diah – were Pongo pygmaeus morio, which naturally occur in the eastern part of Kalimantan. A transfer process had to be carried out. At 14.31 WITA, a Twin Otter fixed-wing aircraft carried Yayang, Sayang, and Diah from Central Kalimantan to Sepinggan Airport, Balikpapan, East Kalimantan. This journey was accompanied by Program Manager of Samboja Lestari drh. Agus Irwanto, technician Imam Ghozali, and Media Romadona, BOS Foundation’s Communications Officer. Diah was the first to be unloaded from the aircraft, followed by Yayang and Sayang. They were unloaded from the aircraft. After the cages were unloaded, the three orangutans were transferred to bigger travel cages so that they could move much more freely since the next part of the journey to Swakarsa airport would take approximately 20 hours by road. Safe in their travel cages, these orangutans were then loaded onto a truck. At exactly 15.00 WITA on Saturday 30 November 2013, the team led by our Coordinator of Animal Welfare and Forest School 3, Wiwik Astutik departed to Swakarsa Airport. Moved to a bigger travel cage. The previous day, and within our Ecosystem Restoration Concession (ERC) the Kehje Sewen Forest, the team had been busy preparing everything for the arrival of Yayang, Sayang, and Diah, including ensuring the helipad and the exact locations in the forest where we would release these three orangutans were ready. Preparing release and helipad area. Traveling all night, at 08.09 WITA on 1 December 2013, the truck transporting Yayang, Sayang, and Diah arrived at Swakarsa Airport. drh. Anin continuously checked the condition of the three orangutans during the journey and they were all declared in good health on arrival. Yayang-Sayang was being continuously checked by dr. Anin. Meanwhile in Kehje Sewen, the weather was beautiful and clear and brought hope that today’s activity would go as planned. Everything during these finely detailed transport operations depends on good weather! A day of rain can mean that we have to delay all operations and we plan for every eventuality. Kehje Sewen in the morning. Not long after, the helicopter that would take the orangutans to Kehje Sewen arrived at Swakarsa Airport and immediately refueled in order to continue the journey to the forest. While waiting, the pilot prepared the sling line and cargo net that would be used to carry Yayang, Sayang, and Diah. Checking the sling and cargo net. When the helicopter was ready, Yayang, Sayang, and Diah were carried and secured safely into the cargo net. Yayang and Sayang were the first to be loaded, followed by Diah. Yayang-Sayang and Diah were moved into a cargo net. The helicopter was ready to take Yayang, Sayang, and Diah home and at exactly 10:32 WITA, the helicopter flew to the Kehje Sewen Forest. It had been a very long journey for both the orangutans and our team and although delighted to see the orangutans finally go back to the wild, we couldn’t help but feel a mixed emotions between happiness and sadness to say goodbye to Yayang, Sayang, and Diah. Ready to take off to Kehje Sewen forest. Welcome Home, Yayang-Sayang, and Diah! At 11.00 WITA, the roar of helicopter propeller was heard getting closer and closer to Camp 103 in the Kehje Sewen forest. Not long after, the helicopter was seen from afar and flew closer to the helipad carrying Yayang-Sayang and Diah’s travel cages in the cargo net. Safely landed in Kehje Sewen. When the two cages in the cargo net touched the ground and the helicopter landed perfectly nearby, Helicopter Landing Officer (HLO) Masino from Samboja Lestari along with the rest of the team proceeded to open the cargo net and retrieve the cages. Vet Dermawan Saputra from Samboja Lestari immediately checked the condition of the three orangutans who all looked healthy. drh. Putra checked the orangutans condition. After all three of the orangutans were checked by drh. Putra, the team then prepared to carry the three female orangutans to their pre-assigned release points. Since landing in Kehje Sewen, Diah was clearly upset by the presence of the team near to her. Several times she smacked her cage and looked angry when the team were busily securing her cage, in order to easily carry her to her release point. Meanwhile, Yayang looked relaxed, even though her daughter Sayang kiss-squeaked at the team several times. Cages were ready to be carried to the release point. The team immediately carried Yayang-Sayang and Diah’s cages to the release points. As soon as the team went into the forest, the three orangutans calmed down. Diah was no longer upset. She looked relaxed, lying down in her cage while the team carried her cage with great effort. Sayang clung to her Mum. Often her small fingers reached out between the bars, trying to grab the rope around her cage, as if she could not wait to get out. The team carried the cages to the release point. The release points of the mother-daughter and adult female orangutans were on the west side of Camp 103. Yayang and Sayang’s release point was 1.8 km from Camp, while Diah’s release point was 1.5 km from Camp. It took a fairly long time for the team to carry Yayang-Sayang and Diah to their release points due to the rugged terrain. After 1.5 hours, Yayang-Sayang and Diah finally reached the destination. Yayang and Sayang at the release point. Yayang and Sayang’s travel cage was opened by Ario Sambodo, Head of the Operational Department of RHOI at exactly 01:28 pm. As soon as the cage was opened, little Sayang directly dashed out of the cage. 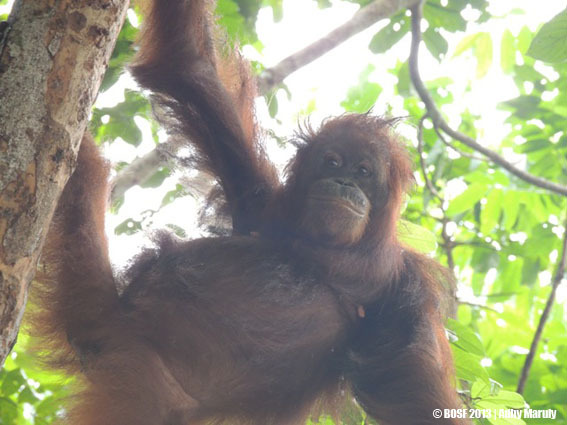 Followed by her mother, Yayang, they both climbed the nearest tree in full confidence. All of those years on the pre-release islands in Central Kalimantan had given these two orangutans an immense learning experience of surviving in the forest. Ariyo Sambodo opened Yayang and Sayang’s cage. Yayang and Sayang then grabbed some Calamus sp., Croton arygyratus and Epiphyte leaves and consumed them hungrily. Sayang swung from one tree to another briskly. Sometimes Yayang grabbed her daughter’s hand to make sure that she was not traveling too far away. If that didn’t work, Yayang simply followed her daughter Sayang wherever she went. Yayang and Sayang, first moments of their freedom. Meanwhile, Diah’s cage was opened by Azwar. He is one of the first team of experts who conducted the initial survey of Kehje Sewen forest to ensure its suitability for orangutans. Azwar opened the cage at 01.52 pm. When Azwar opened the padlock, Diah sat impatiently waiting and sometimes shook her cage. 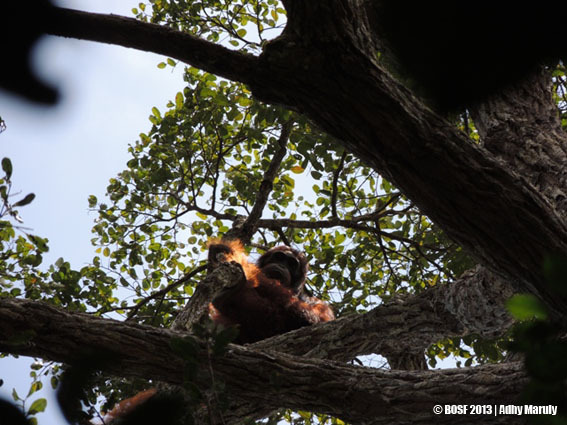 Once the cage was opened, this lovely female orangutan directly made her way out and climbed a towering tree. Diah stopped climbing for a moment to look down at the team, but after a moment continued climbing up higher and higher. Up in the tree, Diah busied herself enjoying young leaves of Croton argyratus. Finally, they are now back to their home province, East Kalimantan. Yayang has been living in Central Kalimantan for nine years and Diah for 13 years. The Monitoring Team will closely observe them and make sure that they adapt well to their new environment in the Kehje Sewen forest, after years of living in Central Kalimantan. 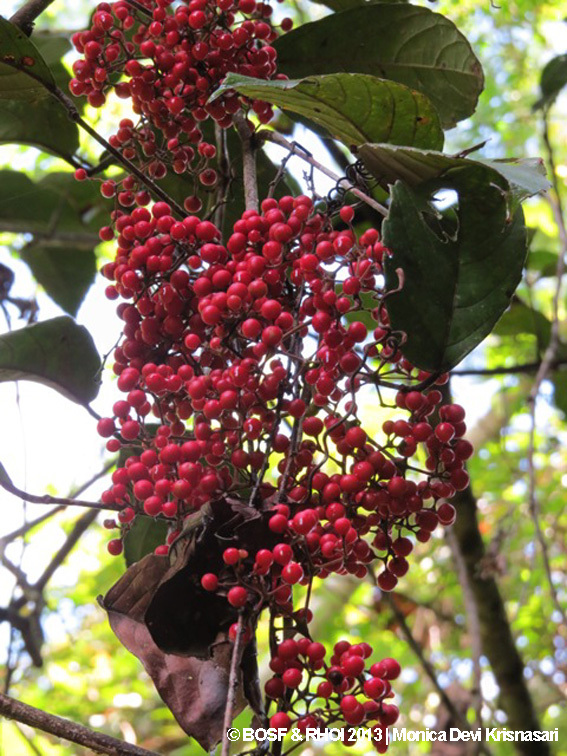 It is currently fruiting season in Kehje Sewen and there are an abundance of Liana, Geunsia pentandra, Artocarpus sp, Palaqium, Koordersiodendron pinnatum fruit available, plus many more (Adinandra, Macaranga, Geunsia pentandra, Aglaia, Litsea, Croton argyratus, Calamus, Epiphyte, Ficus). Yayang-Sayang and Diah should have no trouble finding food. The three orangutans are enjoying their new home to the fullest and were observed happily consuming the variety of fruits available. Once settled, we let them enjoy the dense Kehje Sewen forest while we returned to the camp full of emotion and hope for their future. Welcome home, Yayang, Sayang and Diah and enjoy the delightful fruiting season. Yayang, Sayang and Diah’s release event is the first cross-province release conducted by the BOS Foundation. On this occasion, Masino, from Samboja Lestari also had a first time experience! He was appointed and trained as one of our Helicopter Landing Officer’s. With his clear direction, the helicopter and orangutan cages landed perfectly on Camp 103’s helipad. 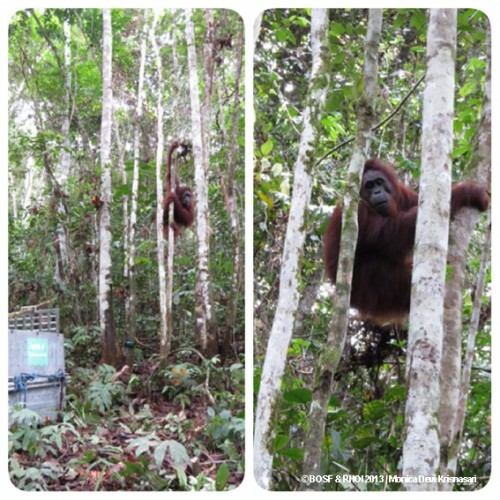 Having completed his first task in this new role, Masino then joined the RHOI team in taking Yayang, Sayang and Diah’s cages to their release site. Masino admitted that he was a little nervous in his new role as a HLO – it is a huge responsibility. It was a big moment for the BOS Foundation to safely transport orangutans from Central Kalimantan to their true home in East Kalimantan for the very first time, and the final part of this task was Masino’s responsibility; to safely direct the helicopter so that Yayang, Sayang and Diah would land safely. Masino hopes that all of the 5 orangutans (who he knows very well) that we returned from Samboja Lestari to Central Kalimantan, especially Cici who is very active, can adapt well in their natural habitat and be released back to the real Central Kalimantan forest as soon as possible. Congratulation and a big thank to Masino who has done his job very well! Keep the spirit burning! Orangutan release activities – especially cross-province activities – are very costly. Help us send more orangutans home by donating at http://orangutan.or.id/donate. Text by: Paulina L. Ela (BOSF Communications Specialist) & Monica Devi Krisnasari (BOSF Adoption Program Coordinator). Photos by: Indrayana, Media Romadona, Monica Devi Krisnasari, Awal and Suwardi.